Have you ever wondered how far Santa Claus has to travel to get to your house? 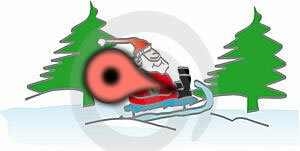 You can find out how far it is between the North Pole and your house by using the tool below. You will also be able to see a map showing the route Santa will take from the North Pole to your house. Santa holds a huge list of children who have been good throughout the year. This list has the addresses, post codes and ZIP codes of all the children. The population of the world right now is 6,630,000,000 so if 27% of the worlds population is below 15 years old then Santa has had to visit 1,790,100,000 children (nearly 2 billion). The list, of course, gets bigger each year as the earths population grows. Santa has less and less time every year to delivery all the presents to the good children on Christmas Eve, but you can find out how far he has to travel to get from the North Pole to your house. Please contact Free Map Tools if you experience any problems using this tool. I love santa but ice bern won ive been good but I don't receive any gifts just this one time... I hope I can recieve even one gift..
Santa I hope you know that your elf on the shelf is at my house and he is always watching me and I hope that he tells you I tried my best to be absolutely amazing and kind and nice your elf is very funny and I hope he can come back next year I love you Santa and hope you and the world have a very merry Christmas thank you for listening and reading Santa hope you like chocolate chip cookies!!!!!!! Showing the most recent 20 out of 311 comments. Click to see all the comments.